Los Angeles’ Bid to host the Olympic and Paralympic Games in 2024 has been under significant pressure after last week U.S. President Donald Trump announced an Executive Order to ban inbound travel by citizens from some countries. At stake is the participation of accredited athletes competing in international competitions within U.S. borders. Since last Friday, some athletes have already been excluded. As a retaliatory measure for the Trump’s action, Iran Friday banned U.S. athletes from traveling to the wrestling World Cup event to be held in Kermanshah starting February 16. The recent events underscore how Trump’s divisive “America First” policy could have far-reaching impacts on the sport world, and how Los Angeles’ Olympic bid could suffer collateral damage from the crossfire. LA 2024 bid officials denied any possible setback during a press conference Friday that had been arranged to discuss the launch of the bid’s international promotion phase of the campaign. Until the election of the host city set for September 2013 in Lima, the three bids, including rivals in Budapest and Paris, may now lobby International Olympic Committee (IOC) members and other stakeholders and produce advertising in order to spread their messages across the globe. 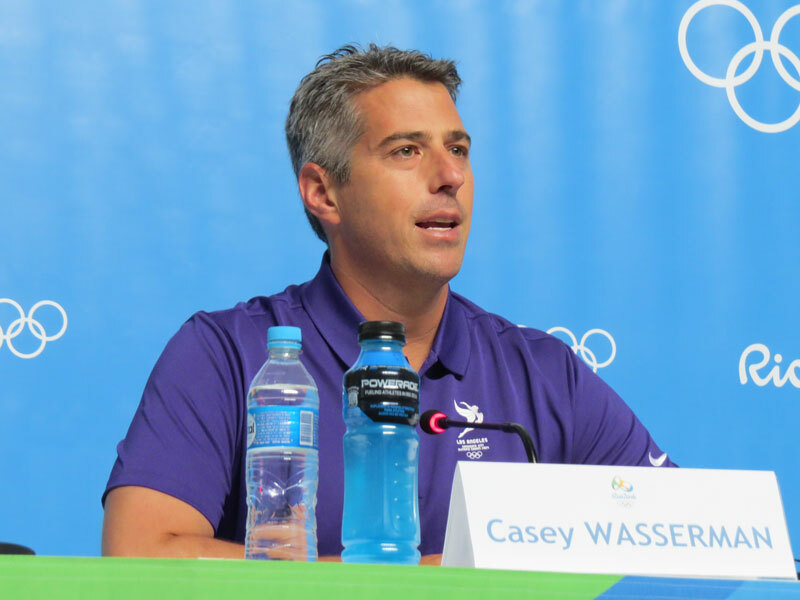 “The IOC has always acted in the interests of sport above politics,” bid Chair Casey Wasserman said. “When we raised our hand to bid for the 2024 Olympic and Paralympic Games it was because we believe in the power of the movement to unite the world, and that was the ability to unite the world with sport, not politics. “We will be judged on the merits of our bid, not politics,” he added. Bid CEO Gene Sykes assured that the United States Olympic Committee (USOC) and the bid committee had the right connections to safeguard the rights of athletes. It’s a unique struggle for LA bid officials who now need to convey a global message of unity, diversity and inclusion through a political smokescreen that screams division and intolerance. To some this mixed message evokes American arrogance, but LA 2024 leadership disagree. “I don’t think we’re saying ‘you have to do it our way,’ in many cases we’re doing it the way other people have shown us how to do it,” Sykes said.